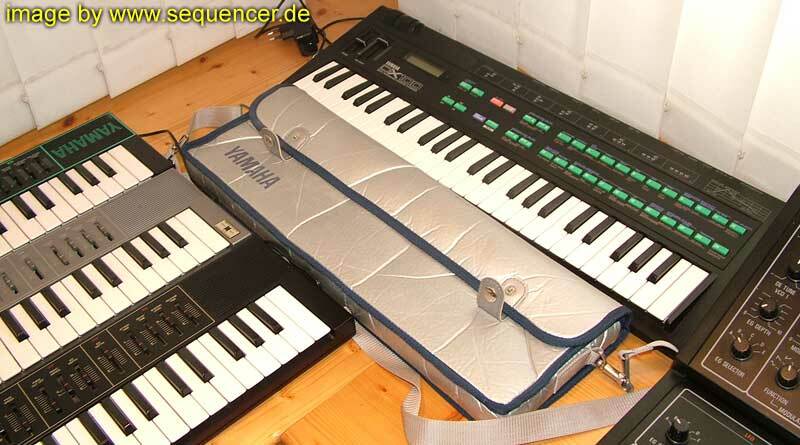 YAMAHA FM synthesizer dx7 fs1r dx7II tg77 sy99 dx5 jellinghaus etc.. MENU searching for another YAMAHA? analog - CS series / die CS serie..
ex5 / ex7 FDSP, VL and more scroll full down..
Vl1 / vl1m / vl7 / vp1 - physical modeling..
download some mp3s: how does FM sound? Yamaha FM synthesizers. for yamaha EX and vector series scroll down..
find a complete "how to make a bass with FM" tutorial here / Tutorial für FM Bass Sounds hier..
the biggest dx ever: incl a special algorithm display!.. frequency modulation fm synth - how FM works? the most exiting thing maybe the enormous dynamics, because every OP envelope (OP = operator = oscillator) could be set individually to respond to velocity. yes: every OP has a dedicated output level and ratio and multi-stage envelope. the speciality with yamaha is: you need to think different: the rates are "angles",so 99 is the fastest possible rate! (don't confuse this!).. 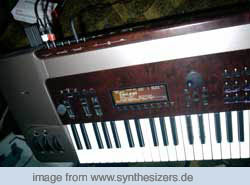 at the same time yamaha put out the 4 OP systems (cheaper), DX9 (1983) and later the DX21 that had split and dual mode like the DX5 and the poly mode only synths DX27 , DX100 etc.. all 4OP synthesizers. 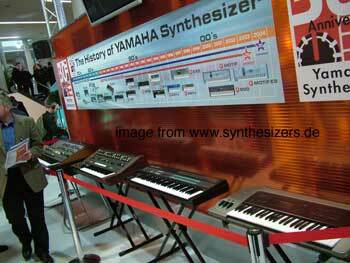 more 4 OP synthesizers? the V50 workstation, DX11 (the first 4OP - multimode dx! ), TX-81z (racked DX11), FB01 small module in a "cheap" looking case. (smaller than 19", not rackable but an expander)..
also they introduced rack modules like the TX-7 (the non-rackable but desktop DX-7) and the big TX816 . it had lots of tf1 modules that represent ONE DX7 each,so you could eqasily have 8 DX-7's in a rack!.. the TX216 had 2 TF1 modules 1985.
the dx or fm synthesis is well known for bell and rhodes sounds, but it can do much more than that!! 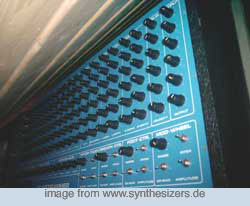 or fm basses got popular in the 90ies ;) but autechre and other new electro bands showed there is another use of fm synthesis sounds!! the first generation DX had 12bit DA converters, so you had aliasing and "hard" sounding sonic "response". -1st generation DX series (80ies, a bit rough sounding 12bit converters): DX1,DX5, TX7 , DX9 , TX816 / TX216, DX21. click to enlarge DX7 , the legendary 12bit one..
DX27 , DX-27 s/ DX27L , DX100, FB01 , DX-7IID , DX-7IIFD , DX7s , TX-802 , TX81z, DX-11, V-50 , TQ05 ... 16bits AD from now! higher quality. on the DX7II / DX11/TX81z models. 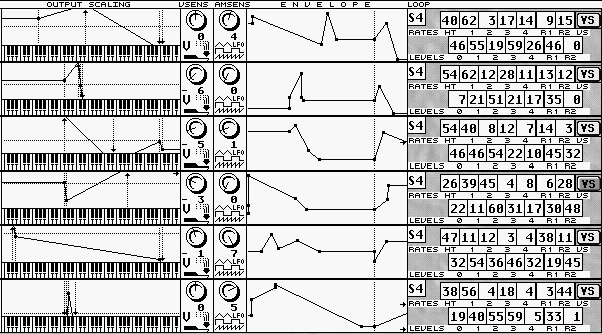 very cheap 4OP synth with 8xmultitimbral synth. you can change everything as long as you use a software editor. but: well, for FM you should consider editor software anyway. the 4OP and 6OP Range also took place in Yamahas "keyboard" range and some "exotic" keyboards (cheap to mid price range). even sound cards..
the keyboards on the left are also used for the CX5M Computers..
3rd generation: TG77, SY77 , SY99 added samples (77:rom, 99: ram), designing your own algorithms and up to 3 feedbacks and nice spx like FX (spx1000 x2 on the SY99) and : from now on no1 could say FM sounds thin!! 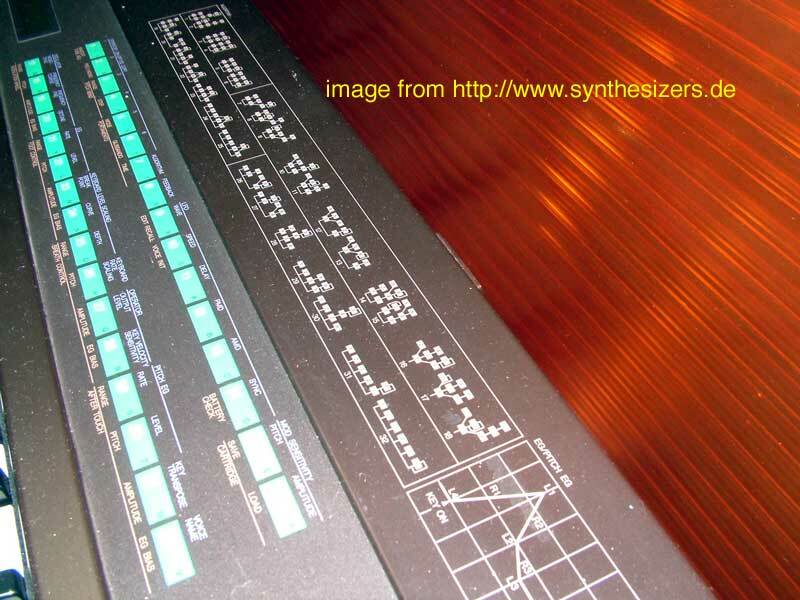 thats still refering to the 1st/2nd gen fm synths .. 20bit AD now.. more hi-end sound but some prefer the 2nd generation for "authentic" dx sound (rough and hard) we are talking about small changes..
<-- 3rd gen FM: TG77 pic thx to lostweb. 4th generation: FS1R , the only 8 OP + 8 OP(unvoiced) synth! 5th generation: dx200, plugin concept: works on most yamaha workstation called plg100dx (beside modules for physical modeling aka vl70m, piano and VA (called AN) etc.. well ,the dx-200 is almost soundwise the "2nd generation"..
the DX7 got updated for its old style 12bit D/A converters. so the DX7II and DX7IIFD (and dx7s) were born 1987 (read about disk format of it under "digital" or tricks). there was a rack version also: the TX802 . 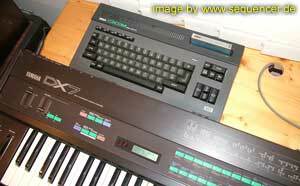 the 2nd generation DX7II had unisono mode!! find the DX7II as a rack " TX802 " . find unisono in TX816/216, TX802 , DX7II series and layer-type sounds on the FS1R ,tg/sy models. the DX-21 and DX11/tx81z have performance and/or unison modes ,too! which is very interesting!! sounds fat! today you can get a "hardware plugin board" PLG-DX that is in fact a complete DX-7 for CS6X, Motif series etc..
luxury programmer and the most known yamaha fm synthesizer: DX7 , 25 were made by the company from dortmund/germany JELLINGHAUS - controls DX7 , TX7 or TF modules of a TX816 module rack as well..
the latest DX7 - based synth is the strongly expanded yamaha FS1R , has 8 OPs and another 8 "unvoiced" OPs with BPF filters and lots more plus formant sequencing. Yamaha DX-7II Centennial: there was a special version in 1988 with 76 keys, 32voices, means 2 DX7II s in one case.. rare of course like the silver version of the DX7. it's high price may have shocked the ppl and helped not to sell it much, had also FX on board. YAMAHA SY77 and TG77 that had samples on board and the first FM synthesiizers form yamaha with filters (well you do not necessarly need them in an fm synth) 2 filters to be exact. also extra env for pan and samples that could be included in the FM signal path (As an operator), had 3 feddback lines instead of 1, the FS1R also has only 1 feedback line. also the TG77 , SY77 and SY99 all had a free assignable algorithm. 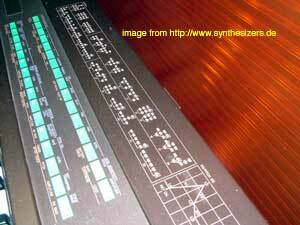 the SY99 had some ram slots to use OWN samples with!!.. 4 slots, 512MB each. available. thats the main difference and the 2 spx900 FX processors. the TG77 had ind. outs. the SY77 and TG77 had a smaller fx unit, but also 2x2 FX sections as the SY99 but no sample ram. 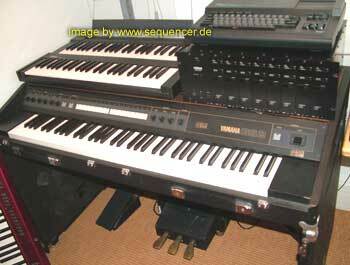 also the tg and sy synths could route the pitch env individually to the OPs unlike all other yamaha fm synthesizers. ONE GENERAL WARNING : most yamaha FM synthesizer KEYBOARDS do have a range from 0 to 120 for velocity! thats,why some people get shocked when they realize: oh, I can not go beyond 120 (121-127 = maximum velocity). so I recommend the racked versions exept if you do not want to use the keyboards for other synthesizers than the internal one!! the old dx, the newer one (DX7II), SY77 .. etc.. they are all limited here.. anyway the SY99 is still the top model for 6OP FM with rom AND ram samples.. the FS1R sounds a bit "nicer" .. and it's response is somewhat "slower".. we are talking about "freak infos" here..
german/deutsch einen test zum fm7 und fmheaven gibts hier..
an FM algo of a 6 OP synth.. software like the fm7 allows feedbacks as many as you like, in the TG77 / SY99 you can have up to 3 of them. 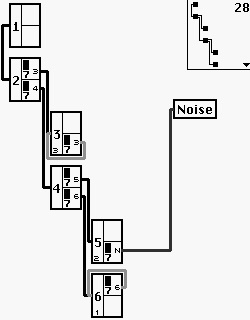 the feedback will generate "noise"-like effect.. but you can create very noise like sounds by using a hi-frequency OP at max level.. this one is the TG77 's algorithm - btw: pm/pd phase modulation is often the same result than the fm systems. 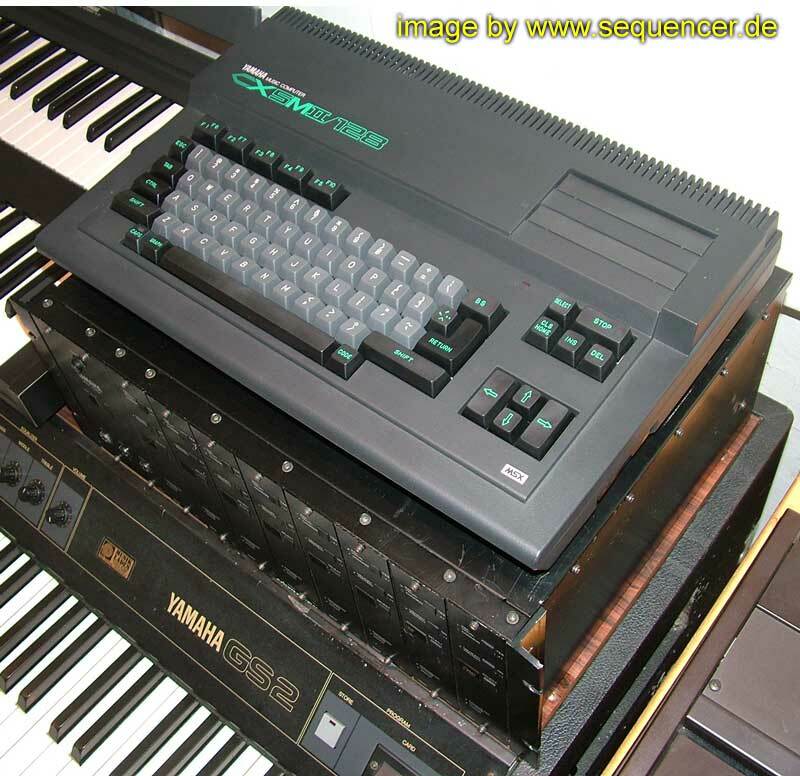 you know, yamha holds the patents, only pd systems can have feedback ,so yamaha themselves used also "PD/PM"..
Yamaha fm und dx synthesizer STORY und INFO - HIER!!! Die Seite von KPR hat eine recht gute Liste mit Software die du austesten koenntest. 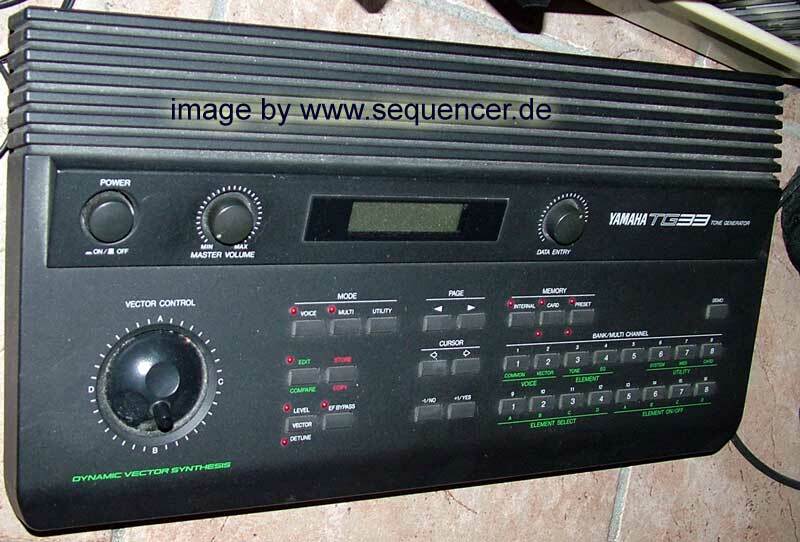 Dave Bensons Page ist auch ein Muss fuer jeden DX7 Besitzer. more FM literature.. free.. off this site..
SUMMA has done a nice table to check the ratio between the OSCs - since FM is based on RATIOS I can tell you why: it is simply easier because you can also check the harmonic content by ratios.. with standard synth absolute frequencies or octaves you also don't have the RANGE 1:32..
1. Ratio Verhaeltnisse entsprechen der Harmonischen Reihe..
the resolution with higher frequencies is much higher with ratios..
VECTOR SYNTHESIZERS , so they all have 2 FM (2OP only) and 2 ROM OSCs (yamaha call it AWM) to blend between with a joystick like the prophet VS or korg wavestation.. the FM is not really accessable, but there are some secret paramters in there.. but not reachable via sounddiver etc. but I have seen 2 editors on PC that will do it.. but is is NOT more than adjusting the spectrum a bit and some harmonics.. but since it is based on FM (ok, it's only 2 Oscs, but its FM!) it should be mentioned here.. they are not bad for pads!.. there is a cool site on the vector series here..
since the samples are 12bit and the FM is 2 Oscillator FM this one is for quite industrial pads!!.. since it is quite cheap you could have fun with one of these..
there are some little differences in the waveforms but most of them are "interchangeable" but not the same.. the tg33 is more a sy22 expander and the sy versions are 8times multitimbral and provide only one stereo out pair of jacks but have layer functionality and SY means 16 voices max. some screens and buttons are different. the SY need to send a whole sound while the tg33 accepts single sysex data, too.. the tg33 has 32 voices and is 16times multitimbral. no foot control (..) it's been said the sy-35 has some 16bit samples, but this is unclear.. but .. well "consider" it could be - tg33 and sy22 are still 12bit..
quite flexible synths, the ex5 is the more powerful one.. the ex7 is a bit "slimed down" ex5 ;) (processor is less powerful here)..
the Cs1X , CS2X and CS6X the Cs1X , CS2X and CS6X are not analogue, they are rom based synthesizers, the cs6x has also plugins slots for yamahas "plug in hardware" like VL, AN, Piano etc. 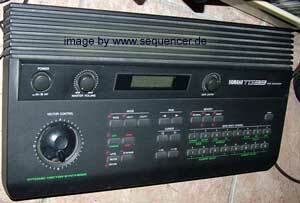 and of course a DX module that is exacly a DX7 !! - basically they have a standard VA-structure but no FM,ringmod etc..
the cs1x and cs2x are almost yamahas answer to techno of the 90ies and offered ok-filters and standard rompler synths - same look like the an1x which is VA (virtual analogue)... but also offers a nice FM section but cannot be compared to yamahas 4,6 or 6OP FM synthesizers .. there are also some other synths that accept the yamaha hard plugins expecially the DX module.. like some MU sound modules and motif series..
the downsized version vl70m or the vl module that can be found in some yamaha mu modules and as a module to slot into their bigger newer workstations. the vl70m is NOT the same as the vl1/7 series and also sounds "weaker". and the FX are also downsized.